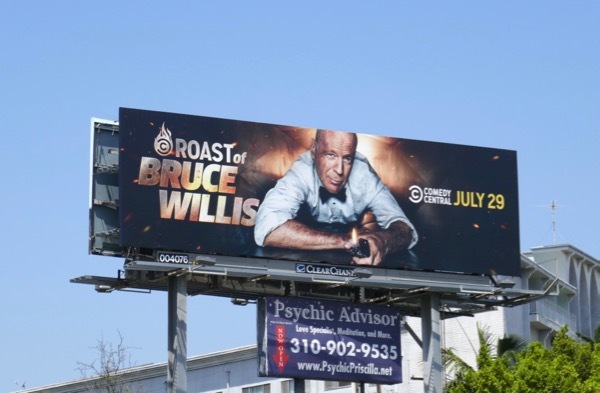 He may have survived all those Die Hard movies, but how will Bruce Willis fare at his own Comedy Central Roast? Throughout his career he's starred in Moonlighting for five seasons, sung 'Under the boardwalk', made white vests famous as the really hard to kill 'John McClane' in five Die Hard films, been married to Demi Moore, surprised cinema goers as a ghost in The Sixth Sense and been Rachel's older boyfriend on Friends. Now if that's not enough material to draw from, we're not sure what is. 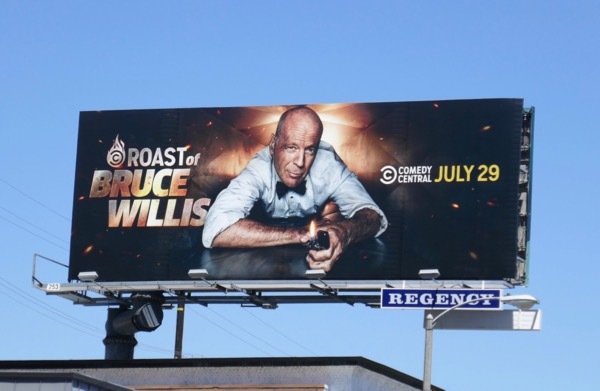 These Comedy Central billboards of the action star in an air vent in an homage to his famous film franchise were snapped along the Sunset Strip, Pico Boulevard and Fairfax Avenue from July 17 to July 23, 2018. 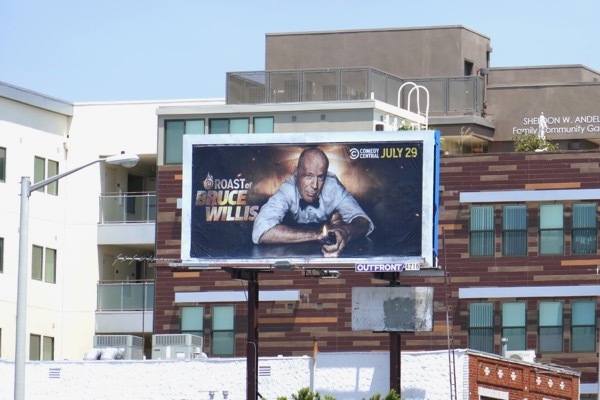 Fans of Bruce Willis can also check out these Looper movie billboards, this Red movie billboard, this G.I. Joe: Retaliation billboard and this Cop Out movie billboard from recent years. 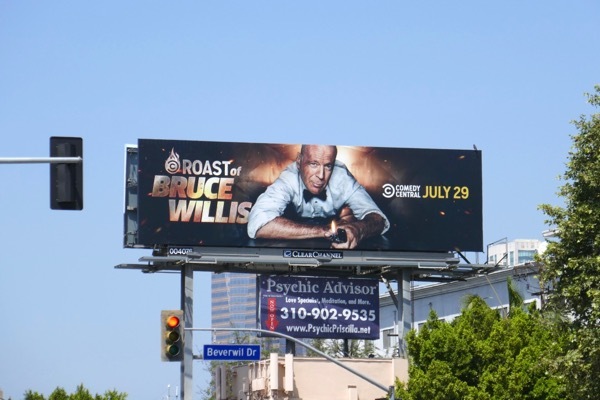 Plus for more celebrities in the spotlight, be sure to also enjoy these fun Roast of James Franco billboards and this Roast of Justin Bieber billboard. And remember, if you can't laugh at yourself then don't let your closest friends, comics, celebrities and family roast you in public. 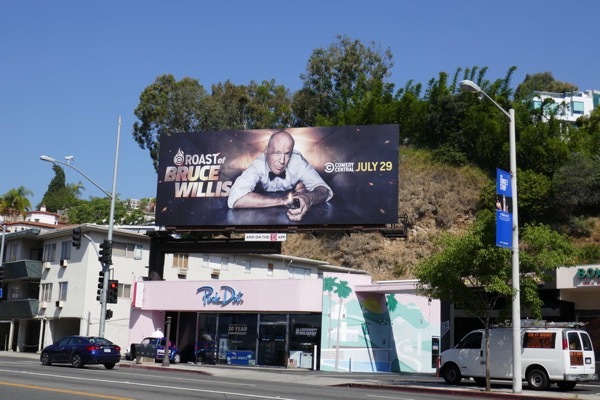 UPDATED: If you loved these Roast of Bruce Willis billboards, then you may also like this Roast of Rob Lowe billboard. 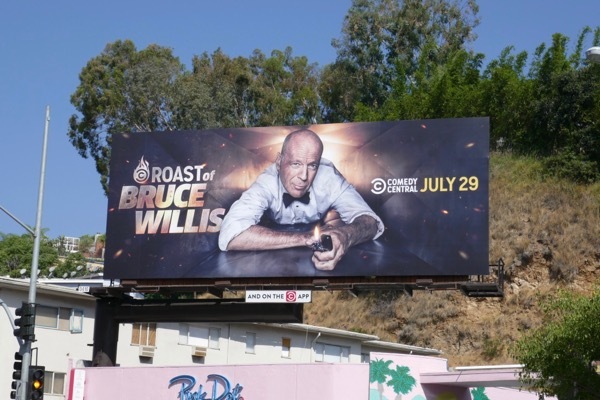 This provocative, double entendre 'Fu*k this guy' billboard was snapped along the Sunset Strip on September 5, 2016.